President Muhammadu Buhari on Thursday inaugurated the Abuja light rail at the World Trade Center. 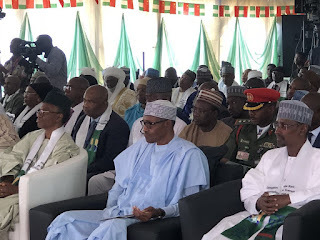 A photo of the President at the ceremony was shared by his Personal Assistant, Bashir Ahmad on his Twitter handle. Kaduna State Governor, Nasir El-Rufai was present during the ceremony. According to Ahmad, the metro station is the first phase of the Abuja Light Rail mass transit and it covers 12 stations within the metropolis.